Zach Glass and Christian Madera, The Once and Future Nerd. Audi-serial, 2013-present. Free online at onceandfuturenerd.com. 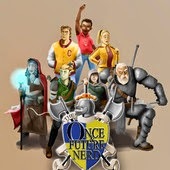 Comic-fantasy audio-serial The Once and Future Nerd (TOAFN) is the brainchild of two unashamedly nerdy friends: Zach Glass, a bioengineer, and Christian Madera, a film editor. Madera came up with the initial idea, and roped in Glass to help write and develop it. Between them, they gathered a group of performers, musicians and sound engineers to create a continuing audio series, with free, downloadable episodes faithfully released every two weeks and extra material loaded up onto a dedicated webpage. As an unpaid project, it’s a labour of love, and if the cast and crew biographies on the webpage are anything to go by, enthusiastically supported by all doing it. Where TOAFN varies from your standard fantasy tale, is in its choice of heroes; and undoubtedly an element of what in fan fiction circles is called the ‘Mary Sue,’ or the insertion of a selfie into a plot, has affectionately crept in. For the story begins with the after-school detention of three recognisably styled high school students; the Jock, the Nerd, and the Surprisingly Well-Informed Blonde Beauty. As self-styled nerds, Madera and Glass are playing one here for the home team! The tone is obviously one fantastical with some comic touches, the central ‘joke’—previously explored in comic fiction and in film, but used again here—being that of the socially-awkward nerd as possible savour. However, this is for the future, as this review is for the first three episodes; themselves longer than the normal 30-odd minutes or less, and the forerunners for the project. From first impressions, this is impressively produced in many ways. The sound is clear, it has its own music—and not just one person with a synth, but a proper band, and judiciously applied sound effects add depth to the proceedings. It was, perhaps, just a little too hesitant to begin with. Especially for the actors playing Nelson, Billy and the Elvish warrior Yllowyyn, this comes across as noticeable pauses before they speak, so that their lines, even if they are meant to be coming with some dramatic pace, seem a little stilted. Whether this is because they were recording apart from their co-stars and thus having to send what becomes monologue—which can sound oddly cut off when it is meant to be parts of dialogue without the other people there to respond, of if they took that extra split-second to speak, I do not know—and the website is not forthcoming with that background. However, once we enter the royal palace with more characters, the speech becomes smoother and more natural to conversation. On a technicality, too; the use of echo for the narrator’s voice continues throughout the episodes. Narrated, we are told, by a sprite of nature, and hence a being with access-all-areas knowledge, also knowledge from familial sprite connections in locations our narrator could not go, he is distinguished by echo effect in his voice. However, it is a distracting trick as it makes his voice far too cold and distant and makes something a lie about our guide to this story being with us to do just that: guide and reveal. Some echo to begin with, shaded then into a more present un-echoed voice would suggest difference, without alienating the narrator from the action so much that it is something of a jar when he performs links or explanations between scenes. These mild niggles aside, what gives TOAFN more legs than other amateur—and, indeed, professional—fantasy productions is that the tone, while admitting of humour, is nevertheless intended as a serious story overall. The title alone is a huge nod towards T.H. White’s humorous Arthurian classics; perhaps an exhortation for comedy and quality? Certainly there are parallels in the lost heir, a kingdom on a tipping point and the fish-out-of-water-ness of unexpected, young heroes. The very geographical oddness of the teens provides the humour, as they bump against the practicalities of dealing with a very strange new world; both out of their own experience and as relatively sheltered young adults. But we are left in no doubt by episode three that this will not be all fun and games; the TOAFN team want to assure us of their grit. The news of the king’s familial woes, and domestic abuse ladled out from a brother to his sister start to provide darker shading that looks set to up the ante with warnings of strong language and ruthless action to come in later episodes. The familiar idea of kingdom-in-crisis-quest-adventuring is often the stock-in-trade of the greater number of ‘high’ or ‘epic’ fantasy stories and is also the format of a fair number of role-playing games. With both writers’ involvement in gaming—electronic and manual—the provision of episodic portions, and the layering on of prophecy and imminent war seem to take their cue from the format of gaming—and this is an excellent one on which to form an audio series. With TOAFN, you get the sense of earnest commitment from the team, which does leave it a little cold to begin with. Getting action going when it would far rather be in the midst of action can be a little boring by comparison, and the first episode or two are a bit shaky in terms of producing an answering warmth from the listener—mostly due to the technical glitches mentioned above. There is always, narratively, a bit of common spadework to be done to get things going, too, and it feels flatter compared to when in Iorden. There is, perhaps due to this feeling of workmanship, remarkably little self-aggrandisement. This is perhaps due to the grounding, ‘what if you were there in the story’ scenario that Billy, Nelson and Jen signify. As representatives of ‘reality’ within the narrative, anything too extravagant would make a monkey of the levels of experience and normalcy (at least, by the listening public’s standards—I am assuming this is not being heard by Elves, Orcs, etc.) that these characters have deliberately brought to the mix. Of course, mythic tales of unlikely heroes often result in the learning process and changing of the heroes into something more—but with the mildly apathetic cynicism of modern youth, time, and the listening of the adventures to come, will tell. What we have here is a solid set-up, but it could do itself more favours in presentation. Humorous hints on the website for a generous donation of a few thousand dollars to turn this into something more visual—and the break for its creators into small-screen fame—show that the creators see this as a very visually processable, audio experience. It is only a shame that a production with so many recognisable tropes to fantasy fandom is quite hidden away. I have not seen it advertise itself on other sites or blogs to any extent, and it is something that could develop a loyal following, with its cheerful, back story-developing website and ready access to episodes with no obligatory financial contribution. Get out there and sell yourselves, guys!